Having even, glowing skin is one of the most beautiful signs of youthfulness. Age spots, sun damage, and other hyperpigmentation give away the years of environmental exposure to which we have subjected our skin. You can lighten and brighten aging, sun-damaged skin to correct discoloration and return your youthful glow so your skin looks fresh and renewed and you look great! There are a variety of ways to lighten and brighten the skin, including topical products you can add to your at-home skin regimen and in-office treatments including chemical peels, Dermalinfusion, and Photofacial. There are hydroquinone and non-hydroquinone products to lighten and brighten skin. Hydroquinone is the single most effective topical ingredient for treating hyperpigmentation because it inhibits melanin production. However, it is a medical-grade product that must be used under the supervision of an experienced professional to reduce resistance and prevent rebound pigmentation. 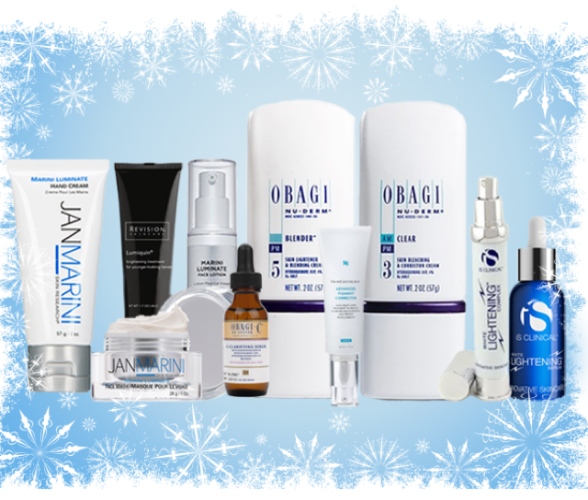 Products like Obagi’s Clear, Blender, and C-Clarifying Serum contain prescription strength, 4% hydroquinone to correct the appearance of age and sun spots for a healthier, more even skin tone. Using Obagi Clear and Obagi Blender in combination with the Obagi Nu-Derm system with tretinoin, which expedites cell turnover, provides maximum lightening results and even distribution of pigment. Non-hydroquinone topicals like Jan Marini’s Luminate line, iS Clinical’s White Lightening Serum and Complex, and SkinCeuticals Advanced Pigment Corrector offer formulas to improve hyperpigmentation through multiple channels, improving the texture while lightening dark spots and brightening the overall complexion. Jan Marini’s Luminate Hand Cream and Revision’s Lumiquin are both formulated to lighten age spots and sun damage on the hands and body. Medium depth chemical peels like Perfect Peel work best for addressing discoloration like melasma because they penetrate into the skin where melanocytes, the cells that produce pigment, are located. Peeling from medium depth peels typically lasts three to four days. Dermal pigment, located in the deeper dermal layers of skin, does not respond well to topical creams and lighter peels, so a deeper peel, like the Obagi Blue Peel, which penetrates deeper into the dermal layer is used. Peeling from a deeper peel lasts approximately seven days. For those not prepared for peeling, a peel like Skin Medica’s Illuminize is extremely light. This peel works in the topmost layer of the skin to exfoliate dead skin cells allowing the skin to reflect light better and leaving it refreshed and bright with little to no peeling. Intense pulsed light, also know as Photofacial, is an in-office procedure that uses filtered light to target melanin in the skin, heating it and breaking it up so that the body can reabsorb it. IPL treatment can both accompany a topical regimen and compliment a chemical peel. Dermalinfusion is a skin-resurfacing facial treatment that lightens and brightens the skin simultaneously by combining exfoliation, extraction, and infusion of Lumixyl, the pro-infusion skin brightening serum that corrects hyperpigmentation, including dark spots, sun damage, and post-inflammatory hyperpigmentation. With so many options to choose from, there is no reason that you can’t have the beautifully bright and even skin you want! Call Dr. Shapiro’s Skin Klinic (480) 451-1700 today to let one of our experienced aestheticians help you decide on your perfect treatment plan!